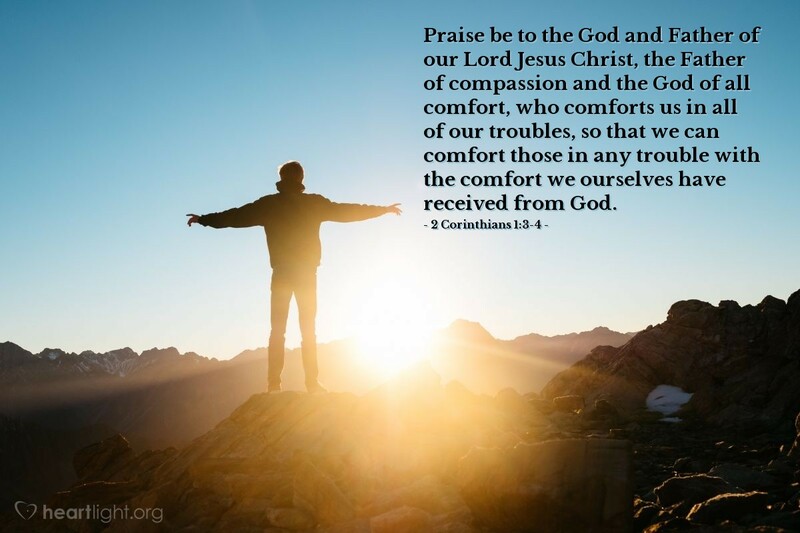 Praise be to the God and Father of our Lord Jesus Christ, the Father of compassion and the God of all comfort, who comforts us in all of our troubles, so that we can comfort those in any trouble with the comfort we ourselves have received from God. We are comforted to comfort others. God doesn't bless us with his presence and comfort of his Spirit because we are somehow better than everyone else. No, he comforts us to equip, empower, and encourage others. God has human hands, but only when I use mine to his glory and for others comfort. Tender Shepherd, there have been times when I was so broken I could not go on. I know my strength to continue came from your rich grace and mercy. Please use me this week to offer your comfort and love to others so they may feel your warm embrace and come to yearn more for the day we see you face to face in heaven. Through my brother Jesus, I pray. Amen.